This new synthesis report from the Pacific Institute and the Foundation Center provides a review of existing evidence about the use of incentive-based instruments worldwide. 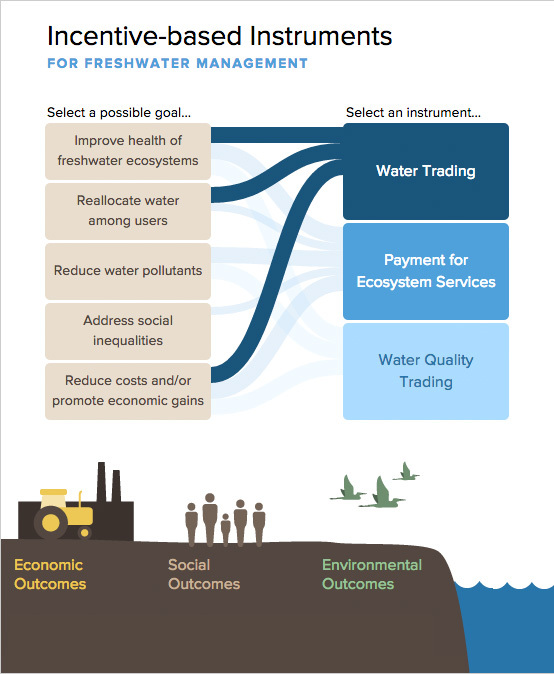 Based on case studies, evaluations, journal articles, and white papers, the authors provide a detailed review of three incentive-based instruments: water trading, payment for ecosystem services, and water quality trading. The report and interactive tool highlight the importance of finding the right fit between a community’s water goals and the water management tool(s) it might choose and, perhaps most importantly, characterize the conditions required for their effective implementation. Originally commissioned by The Rockefeller Foundation, all of the results from this project: the synthesis report, interactive tool, and digital collection are freely available for funders, practitioners, and researchers to use, contribute to, and build on in their work. Explore the digital collection here.